When it is getting cold outside and snow glitters at the top of the mountains, than it is time to light candles. In our living room I love to use tea candles. Dear friend do bring some great smelling ones when they visit. To have those lovely close at hand and keep them in a nice box, I do need the perfect little basket. The mission: a sweet crochet basket. 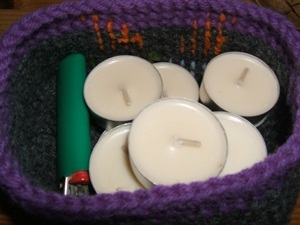 Quickly made and already in use our crochet basket for tea candles. In the back I stored some walnut shells which still wait for their destination - are they going to be autumn decoration or Christmas decoration. The beautiful metal box holds all dear letters, postcards and cards I received during the last months and the empty bottles is used as vase for some meadow flowers or nice twigs. 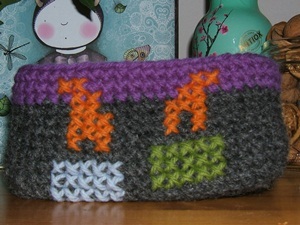 The basket is easily made using double crochet (US single crochet). When the basket had the perfect size I did add a small and quick embroidery. To make it clear what the basket carries, I did choose the cross stitch pattern for tea candles, which you can find here: free cross stitch pattern candles. To have a basket strong and cuddly at the same I used two threads of yarn. If you don't have two balls of yarn at hand, just pull out the the end of your ball of yarn and hook the beginning and the end of your ball of yarn at the same time. I started with the base and did crochet 17 chain stitches. As I tend to have a tight style I chose a hook 8 for the chain stitches. A few stitches and you will get a sweet embroidery for the colder months. Afterwards I did crochet 13 rows of double crochet (US sc). Finishing the base I start with the body and crochet 17 double crochet (US sc) for the long rows and 13 double crochet stitches for the shorter rows (wherever you begin you will start the row with two chain stitches for the first double crochet stitch). After finish 8 rows of anthracite, I did change the colour and worked three rows with violet wool. I just love all shaeds o lilac and violet and think they go perfectly together with dark grey. Choose a cross stitch and start. For the stitches I used the wool with a single yarn. The wool is thick enough and of strong colour to show well on the dark grey background. The pattern of the double crochet stitches(US single crochet) looks like a big Aida fabric and you can loosely pull the yarn from one hole to another. To have a real cross stitch there arr only crosses in the front and only straight stitches in the back – but to be honest, do whatever is fun to you, as you will only admire the outside. The basket is holding my tea candles and a lighter. So be cheerful if you can figure out the stitches the right way and if not enjoy how stitch by stitch the shape evolves. As the dark grey of the body of the basket is already very dark I did not add the stitches of the candle wick - and to my surprise there where people who were not able to see what the stitch symbols meant. 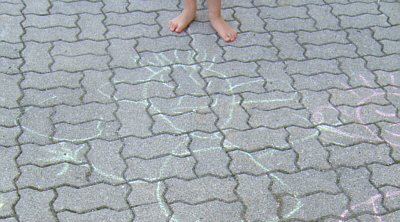 The funniest interpretation was: to giraffes on coloured tables. Never thought that a small woollen basket could cause so much funny conversations and laughters. 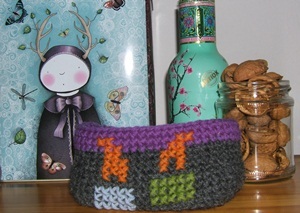 My finished crochet basket measures: 14 x 8cm and is 7cm in height. Close up of my new woollen baskets. 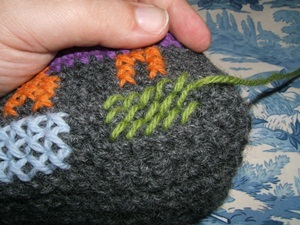 You can make this wollen basket really quickly and the stitches are applied in a few minutes. You can use such crochet baskets as a little gift basket to gift some chocolates or a winter goodie bag with self made bath salt, your prefered poem, nice candles and yummy sweets. If you are in the mood for more selfmade projects, some knitting and crocheting: At MiaDeRoca you can not only buy sheep wool from Salzburg, at our web shop you can get patterns, instructions and DIY kits for felted bags, which are knitted or crocheted and afterwards felted, Kits readily equipped with detailed descriptions and step by step explanations, and crochet patterns which we send as pdf-document by e-mail. By this way you can quickly work some decorations like heart garlands or autumn bunting with trees, there are as well creative instructional ebooks for Christmas decorations.